Q: Why did you found Chef’s Roll? What are you passionate about? We founded Chef’s Roll to help give chefs, who we respect immensely, their due. They are some of the hardest working people on the planet; it is literally a war every time they step into the kitchen. I’m passionate about tech, having been a web developer for over 15 years, but I’m also a big food and wine lover and have even won a BBQ competition. My colleague, Thomas, is equally passionate about food and wine. He’s been in the hospitality industry for 13 years and has managed and opened all types of restaurants and directed a $42 million hospitality operation at Deloitte and Touche in Washington, DC. Q: You say that c​hefs’ digital presence often doesn’t match the quality of their cuisine, what is a good personal anecdote that happened to you that shows that? Many of our “founding chefs” are celebrity chefs that have appeared on TV and own entire restaurant groups. Early on, we were building their profiles for them and, during our research, we found broken links on their websites or information that hadn’t been updated in years. There was a vast disconnect between the bold and beautiful flavors and ambience we were experiencing at their restaurants and what we were seeing on their websites. I don’t want to name names and get any PR people fired! Q: What kind of communication needs do c​hefs have? Chefs are truly the new rockstars. Their fans want to know what events they are appearing at, where they eat on their day off and more about them, in general. Many chefs are constantly reaching for more exposure and participating in food festivals, trying to get TV time, and courting the media. 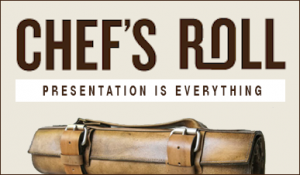 A Chef’s Roll profile gives them a simple solution to be ready when a new opportunity arises and, in many cases, to attract those opportunities as casting directors for top food shows are using Chef’s Roll as a scouting tool. For those chefs that shy away from the spotlight and solely focus on their craft, a profile on Chef’s Roll is an easy way to showcase their passion and hard work without screaming for attention. Q: In the culinary industry, is it all about who you know? How does it work to get jobs on the inside? Absolutely, but more importantly – would that person you know recommend you? Chefs don’t want to be responsible for the weak link in the kitchen, so endorsements are not handed out generously. One thing in our development pipeline is a recommendation engine. I guarantee chefs won’t use it as irreverently as people use LinkedIns; it will mean something. Q: Leveraging the web site, do you believe that it’s possible to find the colleague of a ​chef that you idolize, and end up working for them? Yes, especially by looking at their work history. When I browse through our chefs’ experience section I see restaurants that I have personally eaten at or know the owners of. The culinary world, while seemingly large, is surprisingly small. Chefs are all about mentorship and if you can show that you are genuine and a hard worker, anything is possible. Q: We have to ask, why use Chef’s Roll and not LinkedIn or Facebook? Even our URLs are prettier! As for Facebook, it is a great social tool, but what we offer is a more curated, professional online identity. Plus, you must be a member of those other networks to see someone’s full profile; our profiles can be viewed by anyone. Q: Why did you found the company in San Diego? My co-founder and I both call San Diego home and in today’s digital world, proximity is less important. We have done in-person outreach in some of the major food cities and face to face is certainly important, but we are going after chefs worldwide, not just NY, SF, LA and Chicago. Q: What are the upcoming goals that you have for the web site? Our main goal is on-boarding more chefs for the profiles and restaurants for the job board. Once we achieve more scale we will be rolling out more networking functionality. We are also working on a mobile version of the site since our chefs are always on the go and there is a mobile app in the plans that will have chefs thinking about Chef’s Roll on a daily basis.